Thank you so much to Anne Boleyn Files visitor Teri for bringing my attention to a beautiful piece of 16th century music entitled “My Lady Carey’s Dompe”. I’ve been humming it since I listened to it! “Dompe” can refer to a dance, a dirge, a lament or “a melancholic love song”. One source says that the word comes from “dump” which is Irish for “lament”. All the mentions I found of it online and in music history books suggested that the Lady Carey in question is Mary Boleyn but I’m wondering how that is known when we don’t even know who the composer was. There were quite a few Lady Careys – William Carey’s mother, sisters and sister-in-law – so can we really be sure? I’ll keep digging! By the way, my husband, a Sinead O’Connor fan, pointed out that her “Red Football” has the same chord sequence! Anyway, here are a couple of versions that Teri found – you will notice that the second has an error in its written introduction, it says that Carey was Mary’s second husband! Enjoy them and I dare you to go the whole day without humming the tune! That’s certainly true so perhaps the Lady Carey in question was William Carey’s mother?? All of the music history books I found on Google books dated it to the mid to late 1520s and Willi Apel, in his “The History of Keyboard Music to 1700” writes of how the piece was included “in the manuscript Roy. App. 58 of the British Museum, written about 1530” (p249) so 1540 would appear to late for the piece. I do disagree with what Weir says about the music never having been associated with Mary as a few of the music history books mention her in respect to this piece. We’ll never know but I love the piece anyway. Whatever its history, it’s always been one of my favorite pieces of music. Thanks for posting it! Um – as has been mentioned, Mary was never Lady Carey because William was never knighted. Neither would any of William’s sister’s have been Lady Carey as being daughters of a knight they would only be entitled to “Mistress” as a title. Likewise any brother of William who was not knighted would mean that their wife was never Lady Carey. So, the only Lady Carey around that time would be William’s mother. I have a friend who could probably shed more light in this question as she specialises in Tudor music. For example, she will always point out that the song Green Sleeves is nothing to do with Anne Boleyn and was not written by Henry VIII. The tune is older but the song as we know has been dated to around the 1580s. I really like this, especially the version on harpsichord and lute, so thanks for the link, Bess! Here I am, six years later to point out that although you are 100% right that Mary Boleyn was never truly styled “Lady Carey” it’s still possible that this was still written for her. How many times, after all, is Diana Spencer still to this day referred to as Princess Diana, a style which was never hers? She was HRH the Princess of Wales during her marriage and Diana, Princess of Wales afterwards but still people refer to her as Princess Diana, and if someone wrote a song in her honour it might use that name. It may also be that this song got its popular name some time after it was written, possibly bestowed by whoever published the first popular compilation of virginals music. 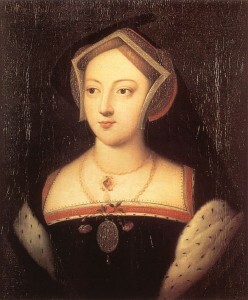 By 1533 Mary Boleyn, as the daughter of an earl, would have been correctly styled “the Lady Mary Carey”. A bit of elision and you get “My Lady Carey”. Wonderful. It sounds strangely modern, at times – the variations and the jaunty rhythm. Beautifully played, too. Thank you. How lovely! I have always loved the music of that time. I would love to hear this piece and many more played in a symphony in a large music hall where the notes would resonate all around you. That would be incrediable. Thanks for posting it, Claire. What a wonderful break from everyday stress you have given today. Thanks Claire for this article and for the music pieces. Once again you are amazing!! I so enjoy The Anne Boleyn Files. Thanks for posting this Claire. I’ve heard it before and didn’t know what it was called. I agree with Robert about how modern it sounds, kind of like Procol Harum’s Whiter Shade of Pale. How lovely is that!!! Absolutely love music from that time period. I could almost picture people doing some sort of dance to it. I love the rhythm of the piece–gets your feet tapping! 🙂 Thank you for posting this! My Lady Carey. Thank you for the leg up as to the person it was written for . It’s my favourite and I’m learning to play it on my accordion !. I thought I’d contribute another arrangement, this time for recorder ensemble. I wrote this a while ago.